The Official Breed Standard for the English Cocker Spaniel. Size: Height at withers: males 16 to 17 inches; females 15 to 16 inches. Deviations to be penalized. The most desirable weights: males, 28 to 34 pounds; females, 26 to 32 pounds. Proper conformation and substance should be considered more important than weight alone. Proportion: Compactly built and short-coupled, with height at withers slightly greater than the distance from withers to set-on of tail. Substance:The English Cocker is a solidly built dog with as much bone and substance as is possible without becoming cloddy or coarse. General appearance: strong, yet free from coarseness, softly contoured, without sharp angles. Taken as a whole, the parts combine to produce the expression distinctive of the breed. Expression: Soft, melting, yet dignified, alert and intelligent. Eyes: The eyes are essential to the desired expression. They are medium in size, full and slightly oval; set wide apart; lids tight. Haws are inconspicuous; may be pigmented or un pigmented. Eye color dark brown, except in livers and liver parti-colors where hazel is permitted, but the darker the hazel the better. Ears: Set low, lying close to the head; leather fine, extending to the nose, well covered with long, silky, straight or slightly wavy hair. Skull; Arched and slightly flattened when seen both from the side and from the front. Viewed in profile, the brow appears not appreciably higher than the back-skull. Viewed from above, the sides of the skull are in planes roughly parallel to those of the muzzle. Stop definite, but moderate, and slightly grooved. Muzzle — Equal in length to skull; well cushioned; only as much narrower than the skull as is consistent with a full eye placement; cleanly chiseled under the eyes. Jaws strong, capable of carrying game. Nostrils wide for proper development of scenting ability; color black, except in livers and parti-colors of that shade where they will be brown; reds and parti-colors of that shade may be brown, but black is preferred. Lips square, but not pendulous or showing prominent flaws. Bite: Scissors. A level bite is not preferred. Overshot or undershot to be severely penalized. Neck:Graceful and muscular, arched toward the head and blending cleanly, without throatiness, into sloping shoulders; moderate in length and in balance with the length and height of the dog. Topline: The line of the neck blends into the shoulder and backline in a smooth curve. The backline slopes very slightly toward a gently rounded croup, and is free from sagging or rumpiness. Body: Compact and well-knit, giving the impression of strength without heaviness. Chest deep; not so wide as to interfere with action of forelegs, nor so narrow as to allow the front to appear narrow or pinched. Forechest well developed, prosternum projecting moderately beyond shoulder points. Brisket reaches to the elbow and slopes gradually to a moderate tuck-up. Ribs well sprung and springing gradually to mid-body, tapering to back, ribs which are of good depth and extend well back. Back short and strong. Loin short, broad and very slightly arched, but not enough to affect the topline appreciably. Croup gently rounded, without any tendency to fall away sharply. Tail: Docked. Set on to conform to croup. Ideally, the tail is carried horizontally and is in constant motion while the dog is in action. Under excitement, the dog may carry his tail somewhat higher, but not cocked up. The English Cocker is moderately angulated. Shoulders are sloping, the blade flat and smoothly fitting. Shoulder blade and upper arm are approximately equal in length. Upper arm set well back, joining the shoulder with sufficient angulation to place the elbow beneath the highest point of the shoulder blade when the dog is standing naturally. Forelegs — Straight, with bone nearly uniform in size from elbow to heel; elbows set close to the body; pasterns nearly straight, with some flexibility. Feet — Proportionate in size to the legs, firm, round and catlike; toes arched and tight; pads thick. Various. Parti-colors are either clearly marked, ticked, or roaned, the white appearing in combination with black, liver or shades of red. In parti-colors it is preferable that solid markings be broken on the body and more or less evenly distributed; absence of body markings is acceptable. Solid colors are black, liver or shades of red. White feet on a solid are undesirable; a little white on throat is acceptable; but in neither case do these white markings make the dog a parti-color. Tan markings, clearly defined and of rich shade, may appear in conjunction with blacks, livers and parti-color combinations of those colors. Black and tans and liver and tans are considered solid colors. One of the oldest types of land spaniel known, the Cocker descended from the original spaniels of Spain as one of a family destined to become highly diversified in size, type, coloring, and hunting ability. Prior to the 17th century, all spaniels existed in a group together; however, the group was eventually divided based on hunting ability and size. English Cockers fell into the small land spaniel group, and in 1892 the Kennel Club (England) finally recognized Springers and Cockers as separate breeds. Prior to that date, and even occasionally after, Springers and Cockers appeared in the same litters, with the only breed difference existing in size. The English Cocker Spaniel Club of America was founded in 1935 to promote the interest of the English Cocker. A number of American fanciers had noticed the different strains of Cocker fast emerging and sought to preserve the variety extant in the English Cocker and established it as a separate breed. The immediate aim of the club was discourage the interbreeding of English and American varieties of Cocker. After much work by the fanciers, the AKC recognized the two breeds as separate in 1946. A comparison of English Cocker Spaniels, American Cockers Spaniels and English Springer Spaniels By Denise Gormish. The following article was originally written to assist shelter workers identify ECS and those relinquishing English Cockers to rescue to understand the breed differences. This is not an exhaustive list of differences and sometimes similarities make it hard to be certain. Others may choose to use this article to learn about the breed differences. I hope it it helpful. If you have a dog that you wish to relinquish to rescue, and you are uncertain as to which breed it is, first look at the registration papers from the American Kennel Club (AKC). If the term "cocker spaniel" is used, it is an American Cocker Spaniel. 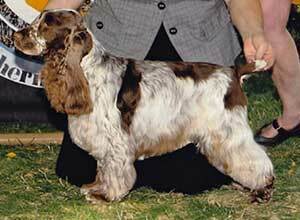 An AKC registered English Cocker will clearly say "English Cocker Spaniel". On the other hand, if the dog is registered with a country other than the United States, the term "cocker spaniel" will refer to the English Cocker Spaniel. American Cocker Spaniels have round eyes, a rounded skull, a more pronounced stop, and a shorter muzzle than English Cocker Spaniels. They come in many of the same colors as English Cockers, but are rarely seen in the roan colors. The classic "buff" color that is so popular among American cockers is not seen in the English Cocker, although there are "red" English Cockers that have a darker red color. English Cockers are a bit taller and heavier than the American breed and tend to have less coat. The head of the English Cocker is more setter-like than the American Cocker. Just because a dog has a longer muzzle or is bigger than the usual AC doesn't make it automatically an EC. Often, it takes someone expert in the breed to tell the difference. Here is a picture of an American Cocker and an English Cocker side-by-side. Notice head and size differences! Left: black and tan American Cocker. Right: black and white ticked English Cocker. English Cocker Spaniels may be many coat colors. They may be parti-colored, with patches of black, liver, red, orange, or gold against a white or roan background. ("Roan" is when the white background is lightly to heavily speckled or mixed with hairs of a color listed above. Roan colors are common in English Cockers, while relatively rare in other spaniels.) English Cockers may be solid colors of black, red, liver, and golden; or any of the above colors accompanied by tan points on the eyebrows, muzzle, throat, rump, and feet. English Cocker Spaniels have a medium coat length. The average size is from 15 to 17 inches at the shoulder, and 25 to 35 lbs.